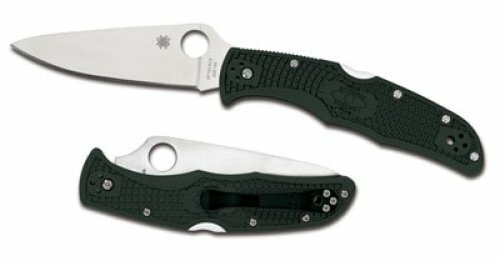 The Endura is one of Spyderco's best selling knives. This is one of the model's that set the industry standard by being the first lightweight folding knife to feature a pocket-carry clip and have a one-hand operable, high-carbon, performance blade. The Endura also includes a backlock locking mechanism with the David Boye Dent. This particular model has a blade made from high-performance ZDP-189 blade steel. Manufactured using powdered metal technology, ZDP-189 is one of the hardest and highest performing knife steels in today's knife industry. Three percent of its component composition is pure carbon which makes the steel harder and the cutting edge more retentive. Features: Screw-together handle construction, Ultra-light skeletonized steel internal liners, Phosphor bronze blade washers for reliability and function, Fiberglass reinforced nylon handles come molded with Bi-Directional Texturing for preferred traction and improved ergonomics, Two-position pocket clip for tip-up or tip-down carry. Specifications - Blade Length: 3.75", Blade Thickness: 0.125", Blade Edge: Plain, Blade Material: ZDP-189, Length Open: 8.75", Length Closed: 5", Weight: 3.6 ounces, Handle Material: FRN.